Even though me and husband south Indians we used to eat chapathi or Paratha on weekdays.We will have rice only in weekends. when we bored of eating our regular chapthi subji, i will prepare stuffed Parathas /Chapathi. This Palak Chapathi is one of the way of taking greens in our diet. 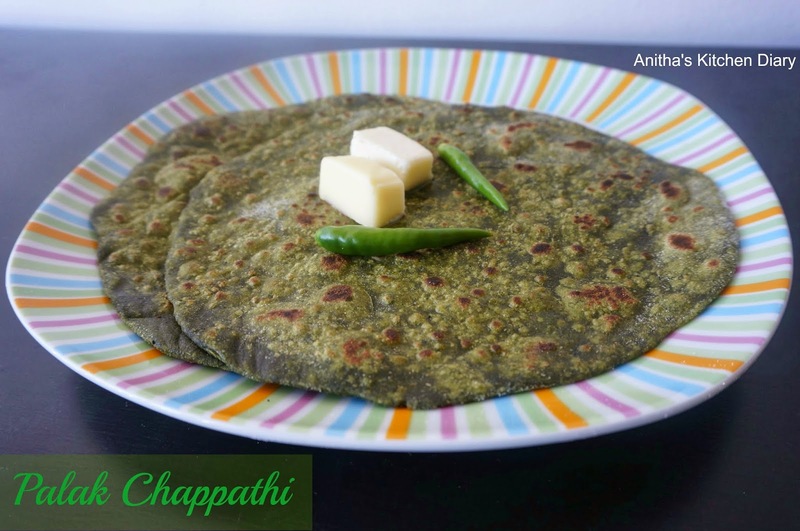 Easy and healthy chapathi. Wash and cut the spinach leaves. In a pan saute spinach leaves for 2 minutes.Cool down and blend it with blender along with green chilli. In a bowl take wheat flour,oil,salt and mix it well. Add spinach puree little by little and make soft dough.Add water if needed.Close the dough with wet cloth and keep it aside for 15 minutes. Divide the dough into equal size balls.Roll the balls into chapati using rolling pin. Heat tawa ,put rolled chapathi and drizzle some oil. Cook on both sides until brown spots appear.